Another striking trend was the sheer number of tweets. 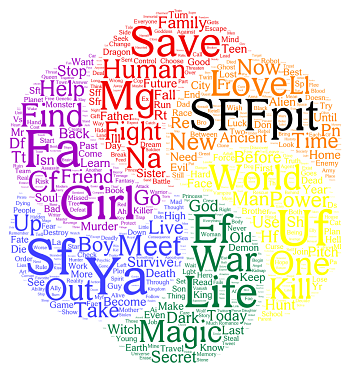 #SFFpit was trending all day, and eventually surpassed 18,000 tweets. Importantly, about two-thirds of those were retweets. In other words, each tweeted pitch was retweeted 2 times. That’s an incredible show of support for the pitching authors. Bravo to them (for supporting one another) and the non-pitching authors who retweeted their favorites. At my last count, 26 agents from 22 different literary agencies participated yesterday. This number is slightly down from last year, but some agents chose to remain quiet on social media yesterday out of respect for the horrific events in Charleston. I’m told that some of them will stop by the feed today instead. In any case, we’re grateful for the time they spent reading pitches. And I hope they’ll let me know if they sign any new clients through this event. One of the bright points in this year’s #SFFpit was the fantastic participation by editors from independent presses. I counted at least 25 editors from 20 different presses. Special thanks to Apex Books, Curiosity Quills Press, Momentum Books, Medallion Books, and World Weaver Press for accepting the invitation! It was a thrill to see these small- and medium-sized presses favoriting pitches. #SFFpit Is Over. What Now? The first day after a pitch contest can be hard. Your anxiety level goes way down, but so does the general excitement. I hope that everyone who participated in #SFFpit yesterday got something out of it. Sure, the stated goal of #SFFpit is to help authors find representation or publication, but yesterday’s event undoubtedly was the genesis of many new friendships. The latter might be even more important. If you received one or more requests yesterday, congratulations! Typically only 10-15% of participants manage to reach that goal. Agents are usually very selective: from the past events, I can tell you that most favorited about 10-12 pitches on average. Some might go as high as 30, others just one or two. Is independent publishing the truly the path for you? It generally means smaller advances but higher royalties. An offer from a small press may not be enough to entice an agent. As Dahlia Adler pointed out, you generally should choose one or the other. That being said, if you do manage to land an agent (let’s say with a different book), they can often make a big difference in negotiating a contract to your favor. Is this publisher the right choice? It may be a harder question to answer. You can look at their own web site, but I’d also recommend checking places like Absolute Write and Preditors & Editors to learn about other authors’ experiences. You can also do an advanced search on Amazon (under Books > Advanced Search) to search for books by publisher to see what they’ve put out. If there are no books (i.e. the press is new), or the books have not sold well, proceed with caution. These contests are fantastic and they sometimes do lead to offers of representation or publication. However, the vast majority of agents are signed through traditional querying. So keep querying no matter what. Even if an agent was in the feed yesterday and favorited tweets right before and right after yours (but not yours), you can still query. No matter what, keep writing: revise and polish your manuscript, find a critique partner, write another book. Success at writing takes time, hard work, and persistence. If you’ve read this far in this post, it tells me that you just might have what it takes.